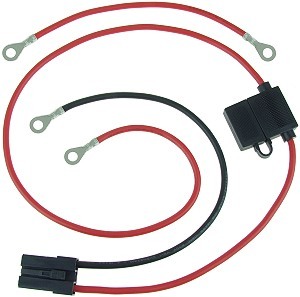 Browse for battery harnesses by vehicle make and model. Multi-fit plug works with outlets that have 2 vertical and 1 horizontal pins (2V1H), and also with outlets that have 3 vertical pins. Two 14 gauge stranded copper wires. 23" overall length. House shaped electric scooter, moped, and bike battery charger or power port with three vertical pins. Two 7" long 14 gauge stranded copper wires with 5.3mm ID ring terminals. 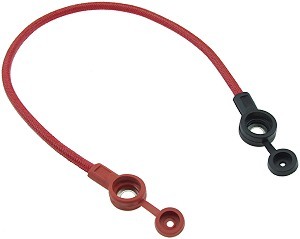 Weather resistant ATO fuse holder with protective cap. Plastic cased high temperature ceramic base. 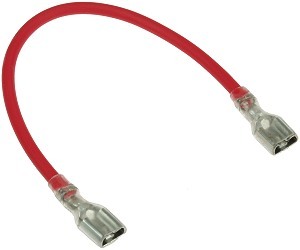 Two 5" long red wires with connectors for 1/4" (6.3mm) wide push-on tabs. Made with 14 gauge stranded copper wire. Rated for ATO fuses up to 40 Amps. 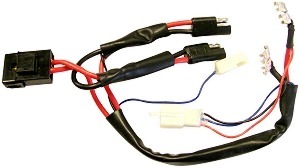 Battery pack wiring harness for 24 Volt Currie® brand electric scooters including, eZip®, IZIP®, Mongoose®, GT®, and Schwinn®. Premium locking tab terminals lock themselves onto the battery tabs until a button is pressed to release them. Made with 12 gauge stranded copper wire. 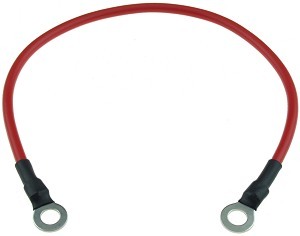 Battery pack wiring harness for many 36 Volt Currie® brand scooters including, eZip®, IZIP®, Mongoose®, GT®, and Schwinn®. Premium locking tab terminals lock themselves onto the battery tabs until a button is pressed to release them. Made with 12 gauge stranded copper wire. 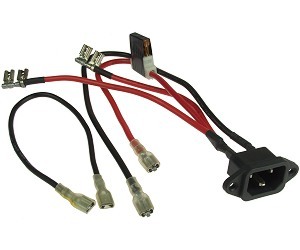 Battery pack wiring harness for 24 Volt electric scooters including certain E-Scooter, Freedom, and Scoot-N-Go models plus many other 24 Volt Chinese-made electric scooters. Premium locking tab terminals for 1/4" (6.3mm) wide push-on tabs lock themselves onto the battery tabs until a button is pressed to release them. Made with 12 gauge stranded copper wire. Overall length of harness is 11-3/4 inches. 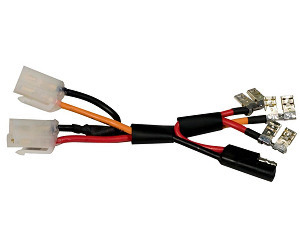 Battery pack wiring harness with fuse holder for 24 Volt electric scooters. Premium locking tab terminals for 1/4" (6.3mm) wide push-on tabs lock themselves onto the battery tabs until a button is pressed to release them. Made with 12 gauge stranded copper wire. Fuse holder is for ATO fuses. Overall length of harness is 11-3/4 inches. Battery pack wiring harness for 36 Volt electric scooters including BMX, Boreem, E-Scooter, Freedom, Salorr, and Sunl models plus many other 36 Volt Chinese-made electric scooters. Premium locking tab terminals for 1/4" (6.3mm) wide push-on tabs lock themselves onto the battery tabs until a button is pressed to release them. Made with 12 gauge stranded copper wire. Overall length of harness is 11-3/4 inches. Battery pack wiring harness with fuse holder for 36 Volt electric scooters. Premium locking tab terminals for 1/4" (6.3mm) wide push-on tabs lock themselves onto the battery tabs until a button is pressed to release them. Made with 12 gauge stranded copper wire. Fuse holder is for ATO fuses. Overall length of harness is 11-3/4 inches. 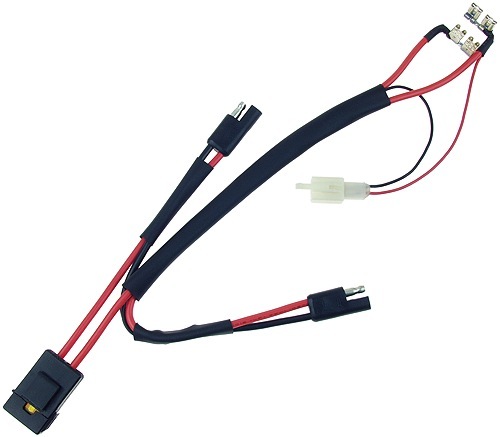 Battery pack wiring harness for 24 Volt electric scooters including certain E-Scooter, Boreem, Freedom, Salorr, and Sunl models plus many other brands. Premium locking tab terminals for 1/4" (6.3mm) wide push-on tabs lock themselves onto the battery tabs until a button is pressed to release them. Made with 12 gauge stranded copper wire. Overall length of harness is 11-3/4 inches. Battery pack wiring harness for 36 Volt electric scooters including certain E-Scooter, Boreem, Freedom, Salorr, and Sunl models plus many other brands. Premium locking tab terminals for 1/4" (6.3mm) wide push-on tabs lock themselves onto the battery tabs until a button is pressed to release them. Made with 12 gauge stranded copper wire. Overall length of harness is 11-3/4 inches. 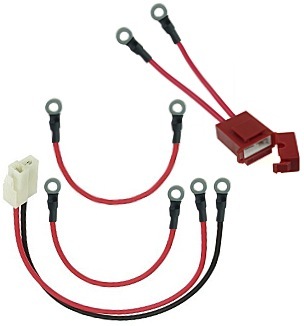 Battery pack wiring harness for 24 Volt battery packs. Ring terminal battery connectors. Ring terminals have a 5.5mm ID and are designed for use with 5mm battery bolts. Fuse holder is for ATO fuses. Made with 12 gauge stranded copper wire. Overall length of harness is 12 inches. 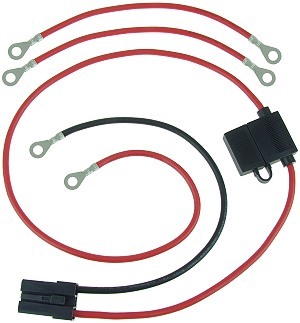 Battery pack wiring harness for 36 Volt battery packs. Ring terminal battery connectors. Ring terminals have a 5.5mm ID and are designed for use with 5mm battery bolts. Fuse holder is for ATO fuses. Made with 12 gauge stranded copper wire. Overall length of harness is 12 inches. 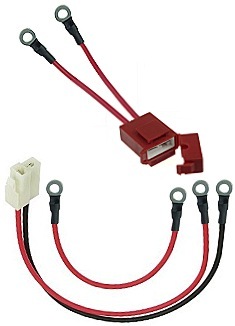 Battery pack wiring harness with built-in fuse holder for 24 Volt EVO electric scooters. Ring terminal battery connectors. 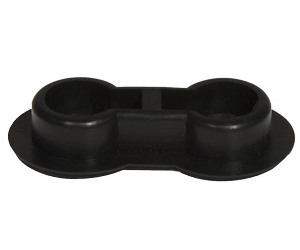 Ring terminals have a 5.5mm ID and are designed for use with 5mm battery bolts. Fuse holder is for ATO fuses. Made with 12 gauge stranded copper wire. Battery pack wiring harness with built-in fuse holder for 36 Volt EVO electric scooters. Ring terminal battery connectors. Ring terminals have a 5.5mm ID and are designed for use with 5mm battery bolts. Fuse holder is for ATO fuses. Made with 12 gauge stranded copper wire. 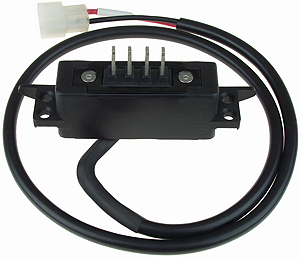 Battery pack wiring harness with built-in fuse holder for 24 Volt EVO electric scooters. Push-on tab terminal battery connectors. Tab terminals are for use with 1/4" (6.3mm) wide battery tabs. Premium locking tab terminals lock themselves onto the battery tabs until a button is pressed to release them. Fuse holder is for ATO fuses. Made with 12 gauge stranded copper wire. 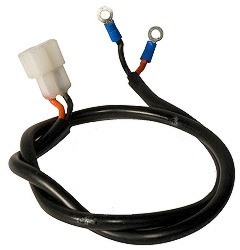 Battery pack wiring harness with built-in fuse holder for 36 Volt EVO electric scooters. 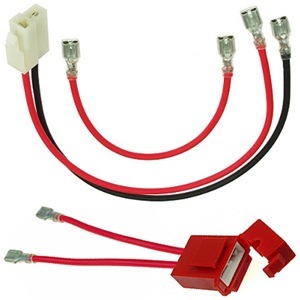 Push-on tab terminal battery connectors. Tab terminals are for use with 1/4" (6.3mm) wide battery tabs. Premium locking tab terminals lock themselves onto the battery tabs until a button is pressed to release them. Fuse holder is for ATO fuses. Made with 12 gauge stranded copper wire. 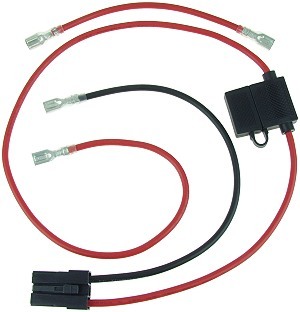 Battery pack jumper cable with 1/4" (6.3mm) wide push-on tab terminal connectors. Designed for interconnecting multiple batteries into a single battery pack. Premium locking tab terminals lock themselves onto the battery tabs until a button is pressed to release them. Made with 12 gauge stranded copper wire. Twelve inch long battery pack jumper cable with top and side insulated 5mm ID ring terminal connectors. Tethered top insulator cap has a small hole in it for battery testing access. These premium class battery cables are made with high temperature silicone coated fabric shielded vinyl insulated 12 gauge copper wire. 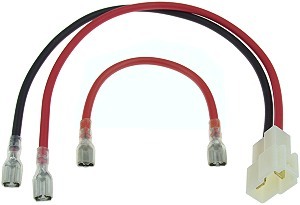 Ten inch long battery pack jumper cable with 1/4" ID ring terminal connectors. Made with 12 gauge stranded copper wire. Connectors are crimped onto the wire and then soldered for extra strength. Designed for interconnecting multiple batteries into a single battery pack. 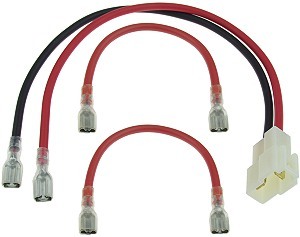 Twelve inch long battery pack jumper cable with 1/4" ID ring terminal connectors. Made with 12 gauge stranded copper wire. Connectors are crimped onto the wire and then soldered for extra strength. Designed for interconnecting multiple batteries into a single battery pack. 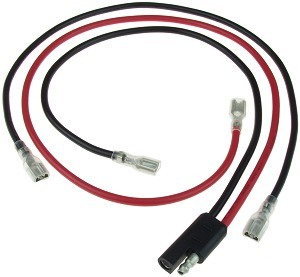 Fifteen inch long battery pack jumper cable with 1/4" ID ring terminal connectors. Made with 12 gauge stranded copper wire. Connectors are crimped onto the wire and then soldered for extra strength. Designed for interconnecting multiple batteries into a single battery pack. 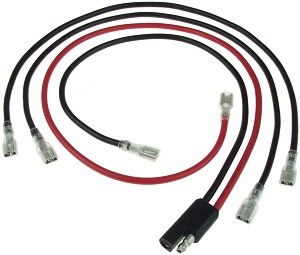 Eighteen inch long battery pack jumper cable with 1/4" ID ring terminal connectors. Made with 12 gauge stranded copper wire. Connectors are crimped onto the wire and then soldered for extra strength. Designed for interconnecting multiple batteries into a single battery pack. 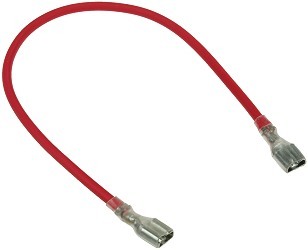 Twenty four inch long battery pack jumper cable with 1/4" ID ring terminal connectors. Made with 12 gauge stranded copper wire. Connectors are crimped onto the wire and then soldered for extra strength. Designed for interconnecting multiple batteries into a single battery pack. 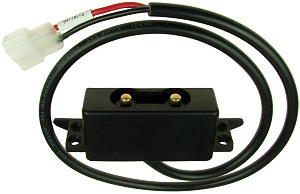 Wiring harness with fuse for some models of Currie®, GT®, Mongoose®, and Schwinn® electric scooter. Compatible with charger ports that have two wires. 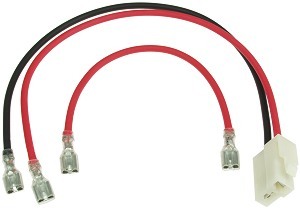 Wiring harness for the eZip® 400, 500, and 750 electric scooter. 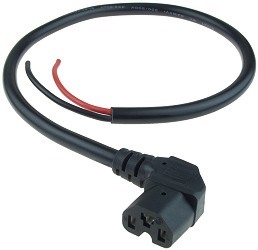 Wiring harness for the IZIP® EzGo electric bicycle removable battery pack. Wiring harness for Currie® IZIP® RMB electric bicycles and Electro Drive® electric bicycle kits. 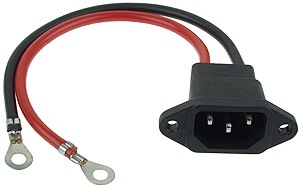 Battery terminal wiring harness for Currie® IZIP® RMB electric bicycles and Electro Drive® electric bicycle kits. 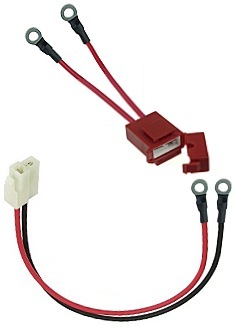 Battery terminal connector with button style terminals for Currie® eZip and IZIP® RMB (Rear Mounted Battery) electric bicycles and Electro Drive electric bicycle kits. Battery terminal cover for battery terminal connector with button style terminals for Currie® eZip and IZIP® RMB (Rear Mounted Battery) electric bicycles and Electro Drive electric bicycle kits. 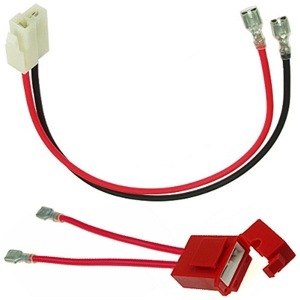 Battery terminal connector with blade style terminals for Currie® eZip and IZIP® RMB (Rear Mounted Battery) electric bicycles and Electro Drive electric bicycle kits.